The Everett C. Parker Lecture has been a tradition in media justice for over 30 years. 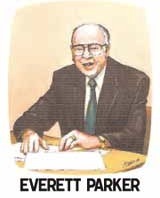 The Annual Everett C. Parker Ethics in Telecommunications Lecture and Awards Ceremony is sponsored by the Office of Communication, Inc. (OC, Inc.) of the United Church of Christ. Past Parker Lecturers and honorees. Archive of prevous Parker Lectures and Award Ceremonies.